This guide is intended to provide you with the basic tools and knowledge to play the druid class. It will offer insight on training, roles, stats and equipment. By the end of the guide, you should be able to successfully choose your path as a druid: a damage dealing beast, a healing monk or ultimately, a hybrid mixing both these amazing powers to achieve your goals. NB: The guide assumes that the reader can purchase luxury items and platinum items. Druids harness the vast powers of nature to preserve or destroy life. With increased experience, they can unleash the raw energy of nature to destroy their enemies, dishing out celestial fury on them from a distance, choking them with enchanted vines, or ensnaring them in immobilizing roots. They can also direct this power to heal wounds and restore life to fallen friends and allies. The druid is hybrid class and is one of the most versatile, under-estimated class in the game. As with other hybrids, druids need to specialize to be most effective in any of the roles they choose. Due to the opposing nature of these roles, they cannot perform one role fully without compromising the other. 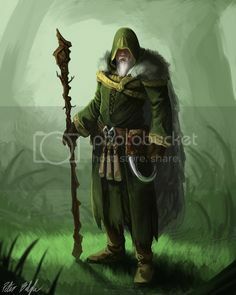 Therefore, druids must switch between roles (optimally with a change of equipment or through a rebirth/alteration) to adapt to a changing situation. This will cost you: 200 000 + 150 000 = 350 000 gp. Also, consider buying sigils of energy and sigils of health as they will help you immensely in the long run. Once you have taken care of this, run back to the beach to start your adventure. For these first few levels, simply follow the starting-line quests. Start by talking to Brennan the Mighty and complete the chain quests. Along your way, make sure to complete Declan's ring quest. Make your way to Dustwither Catacombs and run along the chambers killing the different mobs. Move along the rooms progressively as you level. Once you reach lvl 25, move on to the Death's Caress leystone and navigate those rooms, killing mobs on the western and eastern side. One of the fastest ways of training now is at Shalemont Ravine. Progressively move through the map as you gain levels and most importantly complete the quest line along the way because it provides free experience. Head to the boar pit in the Northern Road of Stonevale. Things will feel like they are slowing down but stay stubborn and true to your goal because it will pay off! Kill the nasty fairies behind Stonevale Farm. Be careful not to attract the other fairies as the Glimmerwing Loredancers can be deadly with their energy shield and firebolts. Kill the blue wisps on the path going off from the farm, then run parallel to the wall, making sure to kill the white wisps on the way until you reach the northern side of stone vale and enter the path on your right containing more blue wisps. Kill those and key back to farm. Head to Loch Dorcha in Fingal's cave to Pirate's island. Progressively move forward as you level. These are very easy to kill as they have low hit points, however they can have high auto damage so be careful. Kill the purple eyes in Otherworld. They will be tough at first but once you reach level 90, they should start getting easier. Head over to the dark blue eyes and kick their butts. A healer is, without doubt, one of the most important asset in a clan and on raids. A druid's healing spells have the potential to be more powerful than any health-restoring skills in celtic heroes. 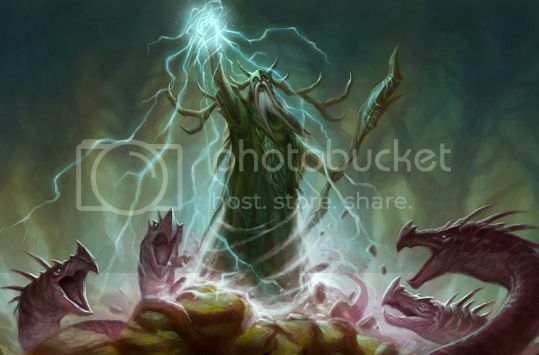 As such, a clan cannot function without a a healer nor can it take down difficult bosses such as Hrungnir, Mordris or the Necromancer without a significant amount of druids. One thing to keep in mind is that a Monk mode druid cannot be held responsible for not having all healing skills maxed and useful. It is the job of the clan to separate those duties amongst the different druids. For example, one druid may be specialized in certain wards and HOT skills while another may choose to specialize in armor/hp buffs and group and individual heals. This obviously means that your nature's touch as well as your heal-over-time spells need to be able to sustain these player's health at a reasonable rate. As such, your main role is to keep the tank alive because if the tank dies, the raid is over, and you have failed your mission. The second, most important role is to keep yourself alive because if you die, then the main tank receives no heals. If you have not managed to get back up and heal him, and if he dies, you all fail. This means figuring out the range of AOE skills and keeping away from it usually by standing behind the tank but it could vary and you may have to stand on the side of the damage dealers of the group. -Keeping your energy and health stable and above 50% - if your energy and health are fluctuating and drop below a certain amount, then you may die or be unable to cast a critical skill during the raid. This means you are as good as nothing. If you cannot maintain your energy, then you should not consider yourself a healer because then you will have failed your two main goals. If your energy does not fall below 50%, then you are on the right path to success. -Concentrate on the boss skill messages - some bosses will call aids during the fight and as such, be prepared to act in a planned out, intelligent manner to take out or help take out the threat. Contrary to a healer whose goal is to preserve life, a damage dealing druid's main goal is to kill. A DPS-druid relies on burst damage skills and damage-over-time (DOT) skills to bring his enemies to submission. However, unlike his DPS counterparts (i.e: rogues, rangers), a DPS-druid has relatively low armor, weaker auto, and in general inferior damage. This does not mean that a smart player cannot outwit/outdps a rogue for example. It just means that it will be difficult for a druid to get the kill over a well-geared, top dps counterpart. The main role of a dps-druid is therefore to deal as much damage possible in a fixed interval of time. You need not worry about healing as this is not your concern anymore. Your focus is on the targeted raid boss and potentially adds and incoming threats. This entails that your damage dealing skills such as storm's touch, lightning strike, stinging swarm, and strangling vines need to be maxed in order to maximize dealt damage. The second most important role is to keep yourself alive. This means avoiding AOE's as much as possible, playing intelligently and not doing anything stupid that could jeopardize the mission. -Keeping your energy and health stable and above 50% - if your energy and health are fluctuating and drop below a certain amount, then you may die or be unable to sustain your skills which may be demanding in energy at higher levels. If your energy does not fall below 50%, then you are on the right path to success. -Concentrate on the boss skill messages - Be aware of your surroundings. Be ready to jump in when adds spawn to neutralize and kick their butts. -Play Smart - Don't just sit blandly on the couch and repeatedly spam skills. This will achieve nothing but drain your energy and ultimately make you spend gold/plat on items you may have avoided using. DOT skills have a certain time limit on them. Only cast the skill when the previous is just about to end. Also, be aware that they may be other damage dealing druids in the group who may have a higher level skill than you. Thus, they may override your skills which means you would ultimately be losing energy which could have been put to better use. By far my favorite build for a druid, God mode combines the two previous builds, yielding a deadly monk who can heal significantly, and deal damage significantly. This mode relies mostly on your equipment. Just with a few switches, you can go from a gentle healer to a crazy lightning wielding maniac . While it may sound like the main role of this class is to do 50% of both, a hybrid druid uses his skills mostly to heal the tank and to dish out damage on the side when possible. Remember: once you have been assigned that goal of healing the tank, then you MUST, at all costs, keep that tank alive and this means sacrificing some of your dps to achieve that goal. 1. Keep your target alive. 2. Cast DOT's on the raid boss to decrease kill time. Again, I cannot stress how useful this build is. And any druid can have the power to do so. The power of this build relies on your ability to switch skills by switching gear. A rogue cannot do that for instance. If he takes out his skill rings or bracers, then his skill damage will go up, but his auto damage will not go up that significantly because raid bosses have huge pierce resistance. Keep that in mind ! Understanding what stats to have means maximizing the gain of every stat point gained through leveling. A nice to note with druids is that all three builds have approximately the same build. That is that all points should go into Vitality and Focus. -Focus: Focus determines the total amount of energy your character has available to use on skills. More importantly, skill damages are directly related to focus. This means that the more points in focus you invest, the more potent said skill will be. (It does however reach a plateau but that is talk for later). Notice that skills are also influenced by nature magic. Always have that maxed ! 1. Have enough vitality (through the use of gear or stats) to survive a boss raid or to level in general. 2. In function of that, allocate the rest of the points into focus. Use a rebirth. Start by equipping whatever armour you are currently using. By checking how much HP you currently have with what you have equipped, start by adding points into vitality. Once your are confident that you have enough health (this usually comes with experience and through trial and error), allocate the rest of the points into focus. For leveling, it's more of a preference when choosing your offhand. If you are confident in the amount of vitality and focus you have, then opt for a shield if you are solo training or an axe of triumph. If you want absolute more increased power, buy a focus. What I am trying to drive home is that survivability trumps damage any day. This is because increased survivability means more damage in the long run. Sunfire Charm may be best for Monk Mode if you do not own Garanak gear. At lower levels, aim for energy regeneration bracers. 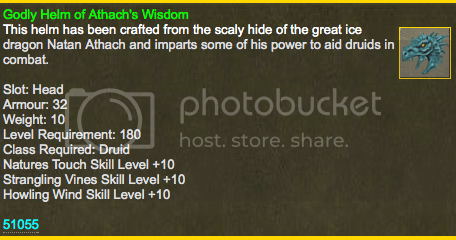 At 150, aim for Aggragoth bracers - pick wisely according to your mode. At high-end levels, aim for mordris bracers - again choose wisely. Feral Mode: Lightning Strike Rings, Stinging Swarm Rings, Strangling Vines Rings, Howling Wind Rings, Storm's Touch Rings. Monk Mode: Nature's Touch Rings, Shield of Bark, Nature's Breath, Nature's Embrace. Hybrid Mode: Mix both of the above. At high-end levels, keep one ring slot open for the Garanak Ring to complete your Shrivewood or Spiritseed set. Nature's Breath: Summon a gentle breath of nature that restores X health to all group members in an 8 meter radius. Shield of Bark: Call upon nature to clad yourself or an ally in an armour of bark increasing armour by X for 2 minutes. Nature's Embrace: Call on nature to comfort an ally, recovering X health per tick, for 45 seconds. Abundance: Fill the target with a sense of the abundance of nature, increasing their maximum health by X. Sanctuary: You summon a shield of glittering light to that protects all party members in range from up to X damage for the next 30 seconds. Abundant Aura: Create a powerful aura of abundance, increasing the health of your target and group members within 6 meters by X. Wards: Cast a magical Ward upon all group members within 6 meters of your target, increasing resistance to X damage by X.
Bless:Grants the target a blessing from Belenus, increasing all their Skill Evasions by X for the next 3 minutes, making it easier to avoid hostile skills. Calm:Surround the target ally in a calming aura, easing the enemy's anger towards them. Rescue: Teleport target ally below level X to your location. Rescued allies also regenerate X health per tick for 15 seconds. Roots: Call upon your Nature Magic ability to ensnare any enemy up to level X, stopping them from moving for 20 seconds. Lightning Strike: Hurl a deadly bolt of lightning towards the enemy, dealing up to X magic damage. Strangling Vines: Use your Nature Magic ability to entwine your enemy in a thorny embrace, dealing up to X damage per tick for 30 seconds. Arguably the best DOT skill. It has an average cool down at a high energy cost. Try casting it first when you are fighting an enemy as it is easily interrupted. Storm's Touch: Call the fury of nature upon an enemy that you touch, dealing up to X damage. Howling Wind: Use your Nature Magic ability to summon a howling wind that buffets your enemy, lowering their attack by X for 60 seconds. Grasping Roots: Call upon your Nature Magic ability to ensnare any enemy up to level X, stopping them from moving for 20 seconds. Energy Harvest: Transfer X energy from the target to yourself. You need to master your stats and equipment to be able to adjust the level of your skills so that they stay dent when you switch rings. Skills that you do not have rings for should have a higher amount of points allocated to them. Skills with high-tier rings should have less points invested in them (unless looking for 50/40) than other skills with lower-tier rings. Experiment, Experiment! It is only through trial and error that you can find the optimal points to invest in each skill. Nature's Magic: Nature's Magic affects your skills. The higher it is, the more powerful your skills will be. Keep it maxed. Totem: If you are a feral druid, have this maxed. As you become stronger, high-end totems will give you decent amount of auto damage which can add flavor to your damage. Evasion, or the ability to evade skills is gained by acquiring evasion abilities. These are Fortitude, Warding, Willpower, Vigor and Reflex. Every 2 ability points boosts your evasion for that type of skill by 1. 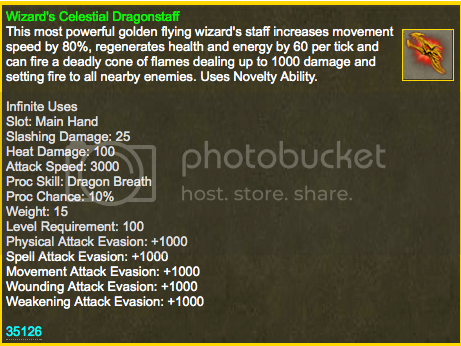 Ideally these abilities should be maxed or as high as possible. That's a wrap on the guide. This is the first of many to come. It will be updated once I figure out best loot from this Halloween Patch. Also, I have yet to finish the leveling part as I am trying to find best spots. Also photo bucket is down at the moment. Will be fixing the final look once it's back up. I appreciate any feedback you guys have. As always, enjoy and happy hunting . Last edited by Arjunlite on Sat Nov 29, 2014 10:24 pm, edited 7 times in total. Because Im too lazy to read all of this, I cannot really say if its a good guide or not. But, be prepared for yor pictures to be deleted. You may want to take some backup ones. Nice guide, someone sticky this? Pretty good overall, I will add this to the Lexicon! 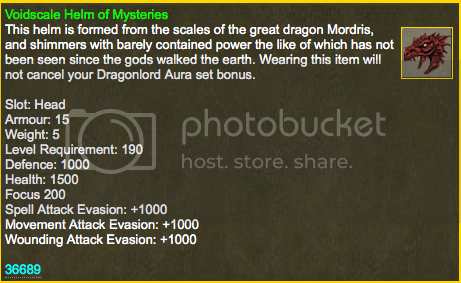 -remove the Atach helm (since it's an event item and rarely availible), and make the godly drops mighty/majestic, as it is highly improbable that those items will ever drop! -Play a druid more, perhaps start without full lux (only the rejuv if you can't handle it), and play from the start.. going from there to create the full experience and then modify your guide accordingly. You need to experience the class more before writing a long guide as yours is. I put the numbers to the left of the skill icons. Those are energy costs. It's a good guide. But like others have said, be wary of using those pictures from that particular website. They are usually edited out by mods. Armo wrote: It's a good guide. But like others have said, be wary of using those pictures from that particular website. They are usually edited out by mods. I thought it was against forum rules to post pictures of items which have not been seen in the live game. I'm using pictures of known items from the website because they look better. I could be wrong though.